We always use to think the best lessons of life were taught and learned in only those four-walled place called a classroom, but we are wrong. The best lessons are learned a few hundred miles away from your comfort zone (home), sitting on a charpoy, a light bedstead and sipping tea with a stranger who is wanting to give his knowledge to anyone willing to lend an ear. You can also learn from quietly flowing rivers, massive yet humble mountains and ultimately Mother Nature who never fails to awe its children. Travel tends to shake things up. No matter what type of trip it is. If you travel alone or with a group, travel will put up face to face with challenges and revelations, some profound and some fleeting. Patience is a virtue that unfortunately not everyone is born with. But it can be learned. Many times while traveling you don’t have the option to walk away, to avoid the 17 hours layover or book online. Every hiccup, every long line, every miscommunication encountered while traveling becomes a lesson in patience and as a result, you learn to take the thing in stride when things get frazzled both at home and abroad. Creativity helps in discovering new perspectives. Especially cultures give a boost to your imagination. The living experience of this kind makes your way more creative and even improves your memory. Due to fear of height, fear of being alone, fear of water we spend most of our lives limiting to ourselves never really living life to its fullest. Traveling would break the ice for sure when you travel. You learn to invent new ways of dealing with situations and learning to step out of your comfort zone because you know it will only change you in a better way. By traveling, we surround ourselves with a variety of people from across the globe. We expose ourselves to new culture, languages, and way of life. We become accustomed to the new and unknown and learn to take it with open arms. Once you start traveling to the woods, you will love the nature. You will not want to return to the city life. All you need is Mother Nature all around, and hence you will start taking care of your environment. The biggest lesson while traveling is to appreciate and enjoy the moment. We are so busy crying or fussing over things that we forget how to understand the life that is passing by. You’ve just traveled across a county tried a new language and haggled over prices in a market. They’re all things you didn’t know.W ith travel come challenges. And the more problems you take, the surer you become. We venture into the world while leaving materialism behind. We pack what we need and nothing more. We learn to live with the essentials things what we have. 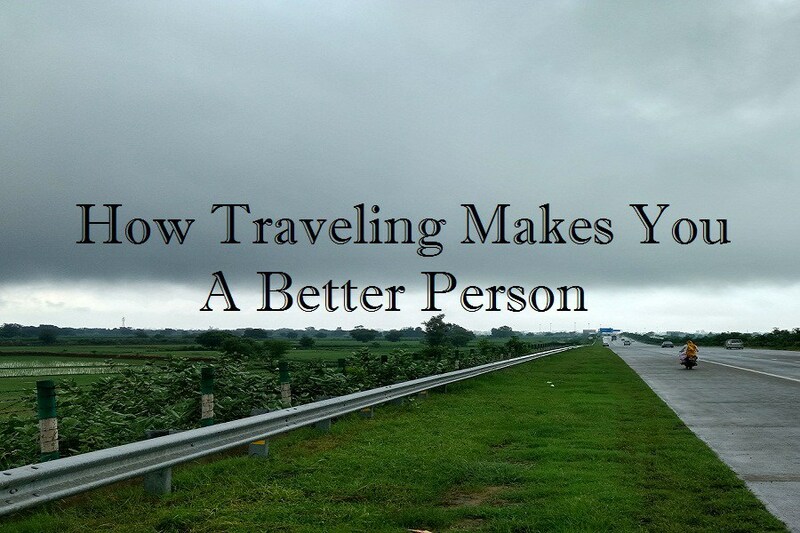 Thus travel makes us appreciate the important things in life. Travel relieves stress and boosts Mental Health. According to a survey, 89 percent of vacationers found they could let go of fear and relax after only a day or two into their trip. Pulling yourself out of your daily routines and into newer surroundings resets both your mind and body resulting in stress relief. Moreover, leisure activities such as traveling can lower level of depression and improve psychological functioning. With a natural boost of confidence, there is a renowned sense of adventure. Once you have taken a few leaps of faith like for instance skydiving the Swiss Alps or eating grasshopper in Thailand, that used to seem terrifying will suddenly make you feel adventurous. If you don’t travel at least once in your lifetime, you will be missing out on one of the most significant opportunities to grow as a person. Travel can truly shape up an individual.